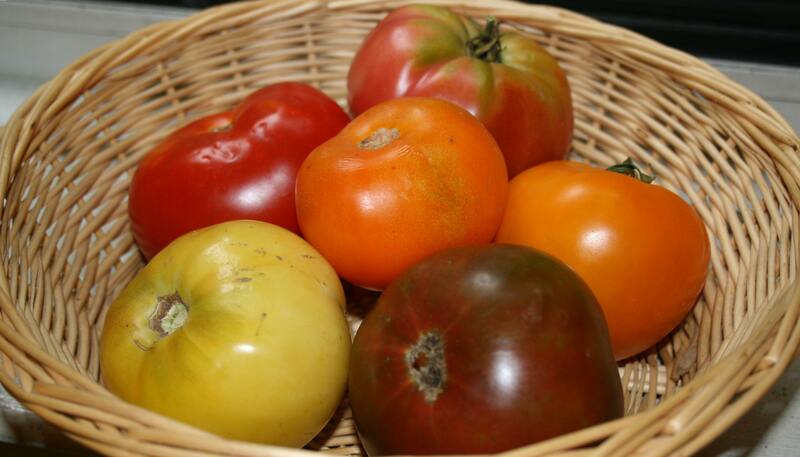 Who doesn’t love fresh, richly colored, and vine ripened tomatoes? They are one of my favorite parts of summertime. Our farm share has provided us with some wonderful and colorful varieties this summer. New York and New Jersey farmers grow the most wonderful heirloom tomatoes I have ever tasted. Before moving to the city, heirloom tomatoes were foreign to me. I was used to the standard grocery store red tomatoes. Ripened off the vine, white or green on the inside, and devoid of any sweetness or real flavor. I had never sliced open a tomato to find the interior as deeply colored as the exterior. My opinion changed instantly after walking through the Union Square farmers market here in NYC one day and tasting the samples of tomatoes. These tomatoes were deeply colored, some soft enough to melt in your mouth, others a more firm, incredible juicy, and surprisingly flavorful! Heirloom is a term used to describe any tomato plant that has been cultivated for more than 50 years and is openly pollinated. Each variety has its own characteristics and best uses. Heirlooms are best sliced fresh and used in a way to highlight their colors. On top of a fresh salad, laid on top of pizza dough with basil and sprinkled with Parmesan cheese, in a sandwich, or on top of sliced garlic bread. Bonus: One tomato provides 25% of your daily vitamin C and 20% of your daily vitamin A needs. They provide lycopene which may lower the risk of prostate cancer. Tomatoes are a very good source of Vitamin K, manganese, and potassium. Other nutrients they provide include folate, niacin, vitamin E, magnesium, copper, and vitamin B 6. My favorite way to utilize fresh, sweet, wonderful tomatoes is in a sandwich I have discussed before. The prosciutto, fresh mozzarella, pesto sauce and sliced tomatoes on baguette. YUM! The prosciutto is optional. Fresh baguette bread and mozzarella are essential. You can add leaves of fresh basil or arugula to add flavor. This sandwich is perfect in the summer due to the abundance of fresh basil at the market for pesto sauce. I usually make a large baguette and slice it into 2-bite pieces for an easy finger food at lunch, snack time, or a lite dinner served with an arugula salad. See my article and sandwich assembly guide at this link – Pesto and Prosciutto. A note about my culinary career – many things have happened in the past month (which is why I have been unable to write as often). I graduated from culinary school, turned one year older, and went on a long hiking and camping trip out West. In four days I begin my internship at a catering company here in NYC. The Cleaver Company, founded by Mary Cleaver, is dedicated to serving seasonal, local, fresh and organic food. They are also a green company and actively participate in recycling and composting programs. The company has been compared to Chez Panisse (on the West coast) and apparently it is the company of choice for Alice Waters whenever she is in NY. I hope to learn how to utilize the freshest local ingredients in a healthful way. I am also interested in how a catering company plans and prepares for events. Stay tuned!